Cooking mussels at home is something that is relatively rare these days. There are, to be sure, the summer beach parties where a crowd enjoys a clambake and beer, but just cooking mussels at home for a family meal is no longer an American habit. It’s a bit out of fashion, perhaps because of the “bother” of those wet ingredients and the need for a huge pot for boiling away. It is, in short, a bit clumsy, a bit inconvenient. No longer. 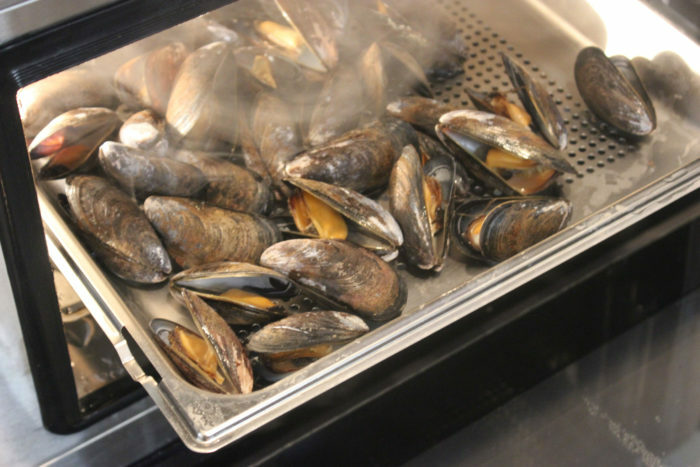 Jenn-Air has the perfect kitchen appliance for you mussel advocates: the Jenn-Air® Steam and Convection Oven. We find the oven to be a wonder, excellent for veggies and dumplings and steaming a British pudding. And, surely, for these mussels. The process here is not complicated, but it is orderly. You make a broth with butter, garlic, herbs and that white wine. Steam the mussels, reserving the liquid that comes out into the drip tray of the Steam Oven. Add that reserved liquid to the broth. Put the mussels into a bowl and ladle in the enriched broth. Simple! You’ll have it down in no time. One tray load of mussels here is about 2-3 pounds, enough for appetizers for 5-6 people, a main course for 4. 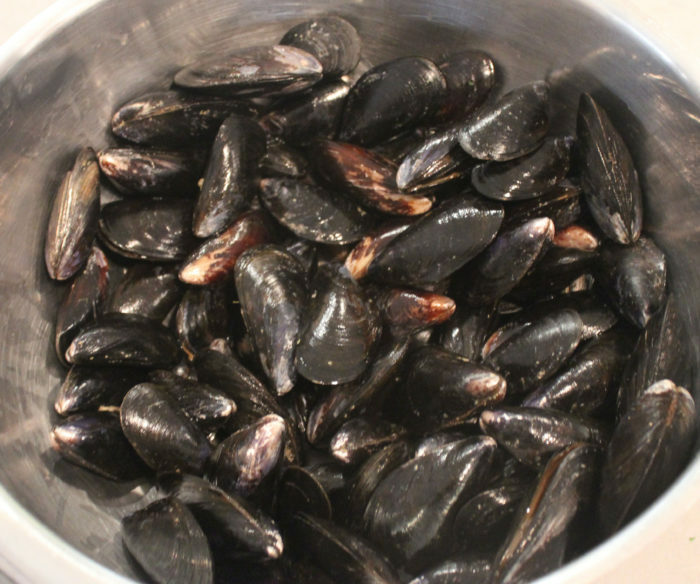 Steaming time varies — the real test is the mussels opening — but will span 5 to at most 10 minutes. The Jenn-Air oven makes it easy to churn out one batch after another, so no one should be hungry. This Jenn-Air appliance uses conventional electric power, while the steam comes from a self-contained water container that your refill. No special wiring or plumbing is necessary for installation. That means that adding this appliance to your kitchen would be an easy task. And a wise one, too. We use our steam oven several times a week. It’s a treasure. 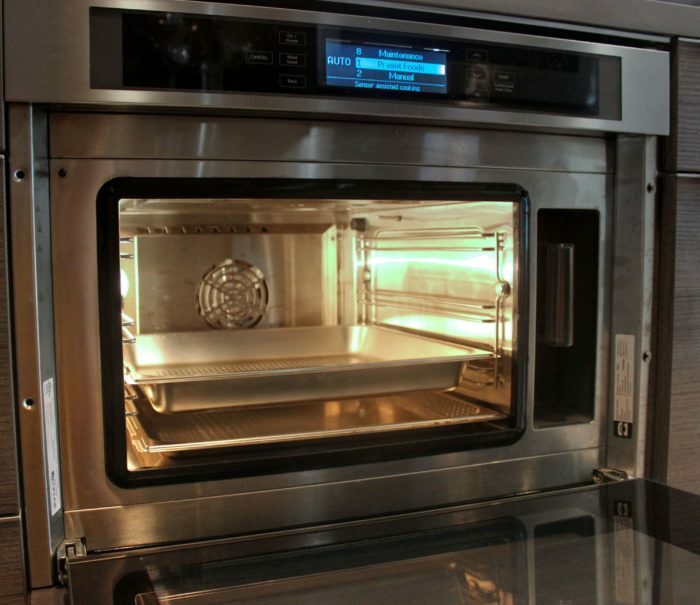 And, it’s a convection oven, too. Oh, you are a bit intimidated by the technology? Don’t be. There is that touch screen at the top of the oven, just like an iPad or tablet. Just navigate to “mussels” and the oven will do everything for you except put the mussels in the tray. You are still going to get a little wet. Prepare the broth. Melt butter in a large stock pot over medium heat. Add garlic and let sizzle for about 30 seconds. Season with red pepper flakes and lemon zest, stirring for about 45 seconds. mussels, and cover immediately. Shake pot and let boil for 1 minute. Reduce the heat to simmer. Follow the instructions on your steam oven and steam the mussels. When they have opened, put the mussels to the side. There is a juice pan sitting underneath the shelf holding the mussels. Take out the juice pan and pour the juices into your broth. Stir and reheat to hot. Place the mussels in bowls and top with broth.